Actor George Clooney and his millionaire neighbor, Howard Gold, held dueling fundraisers for Democratic presidential candidates Hillary Clinton and Sen. Bernie Sanders (I-VT) in Studio City, California on Saturday, within mere feet of each other. The fiscal feud signals deep divisions within the Democratic Party, and the stark contrast in both candidates’ fundraising and social philosophies. Steven Spielberg, Jeffrey and Marilyn Katzenberg, and Haim and Cheryl Saban were among co-hosts for Clooney’s event. 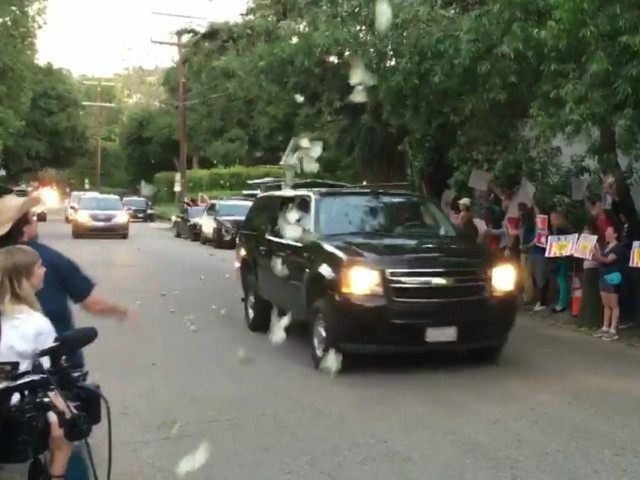 One thousand one-dollar bills rained upon Clinton’s motorcade as it drove past Sanders fans. According to the local CBS News affiliate in Los Angeles, the first three lines from the 1933 song commonly known as “We’re in the Money” was blazing on speakers several hundred feet away at the home of Gold, whose pro-Sanders, counter-fundraiser clocked in at just $27 per person — an homage to the average Sanders campaign donation per person, and a number the Vermont Senator consistently plugs on the campaign trail. Gold, whose family founded the “99 Cent Only” store chain, provocatively named his event the “99% Party.” An email invitation reportedly read “Swimming pools, Movie Stars and merriment for all! This is happening right next door to Clooney’s party for Hillary!” It also noted that “No-one (will be) turned away for lack of funds,” in an apparent jab at Clinton for her ties to Wall Street and liberal Hollywood elites. Clinton’s appearance at Saturday’s fundraiser was her 10th visit to Southern California since she announced her candidacy in on April 12 of last year. Prior to Saturday evening’s event, Clinton spoke at a rally at Southwest College in Los Angeles, which was briefly interrupted by several protesters who were escorted out. There, she pushed her plans to raise the federal minimum wage from $7.25 to $15 per hour, and took renewed aim at Sanders ahead of Tuesday’s New York primary, according to Southern California Public Radio. 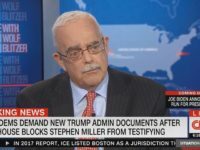 It’s going to the congressmen and senators to try to take back Congress. And the reason that’s important and the reason it’s important to me is because we need, I’m a Democrat so if you’re a Republican, you’re going to disagree but we need to take the senate back because we need to confirm the Supreme Court justice because that fifth vote on the Supreme Court can overturn Citizens United and get this obscene, ridiculous amount of money out so I never have to do a fundraiser again. And that’s why I’m doing it. Although the maximum amount an individual can contribute to any presidential candidate under federal law is topped at $2,700, the higher amount at Clooney’s fundraiser was legal because it was combined with several other joint fundraising committees benefitting Clinton’s campaign, the DNC and the Democratic committees of 33 other states. The upcoming California primary on June 7 could wind up making the difference in the nomination process. Clinton is trending ahead of Sanders by just six points in California so far. However, 12 percent of voters are still undecided.